I thought Gado Gado or Tipat Cantok as it’s known in Balinese was some sort of frisky dance routine when I first heard the name but it is in fact one of Indonesia’s most famous dishes and I am now hopelessly addicted to it. This is a nuisance as it’s not something I can see Weight Watchers advocating, and if they did, it would probably use up all ones points for the day. 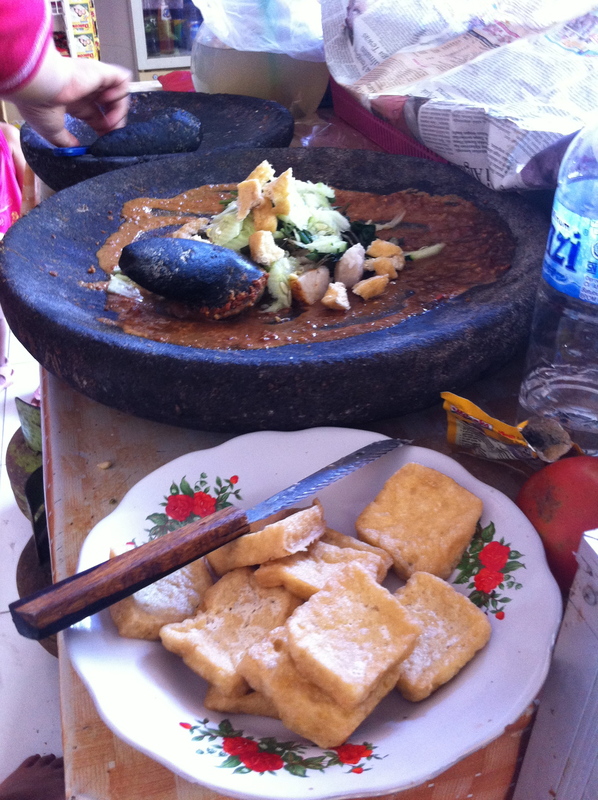 Anyway, what do I know, I haven’t a clue about the points system on WW and I don’t really care because Gado Gado is simply and utterly delicious and if you fancy having a go at making it yourself and don’t have a life threatening nut allergy, then step this way and I shall show you. 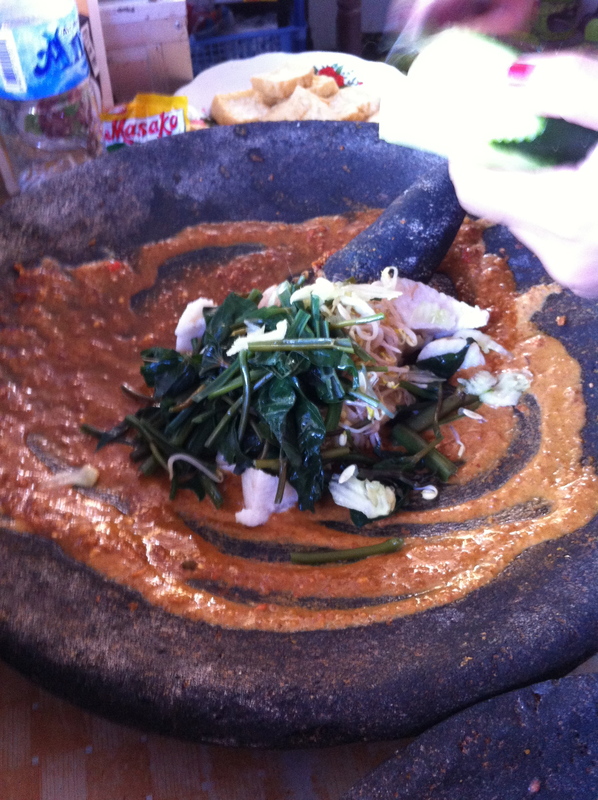 Ah, but before you step this way…..I’d probably better tell you what Gado Gado actually is. It’s a dish made up of lightly steamed vegetables (beansprouts, green beans, water spinach) lontong (steamed rice cake) potatoes, fried tofu, and a wonderful sauce made up of ground peanuts, ketchap manis (Indonesian sweet soy sauce) garlic, palm sugar and chillies, lime and a sprinkling of salt. 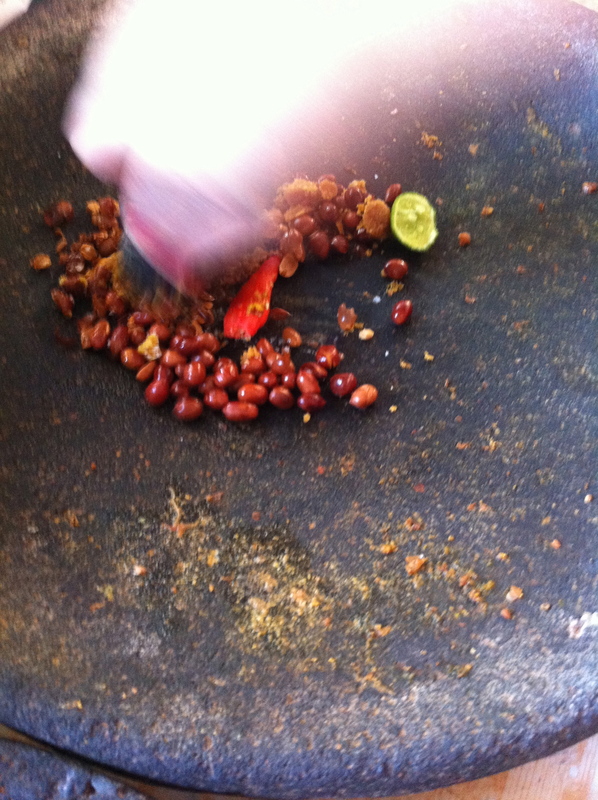 Depending on how ‘Pedas’ hot you want it, depends on how many chillies you put in, I’d stick to one small red one as it’s not meant to be hot, hot this dish, just a tiny bit but go for it if you dare. 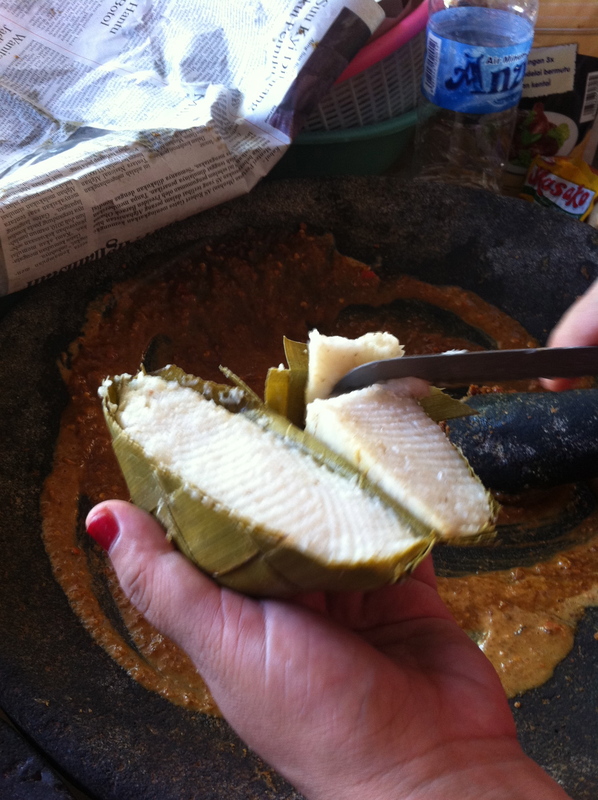 If I was making this in London I would substitute the lontong for more potatoes but use new ones as they are beautiful and waxy and I would head up to Soho and get the Ketchap Manis, vegetables, chillies and some tamarind paste, and palm sugar whilst I was there because we are going to need that in the next recipe. I don’t know if you can get the water spinach in London but if you can’t I’d be tempted to use a few broccoli florettes me self or maybe the dark green leaves of pak choi? Any ideas very welcome! Oh, and one last thing, this is a dish best served up cold so pre steam the veg beforehand and then assemble the ingredients after you’ve made the sauce. 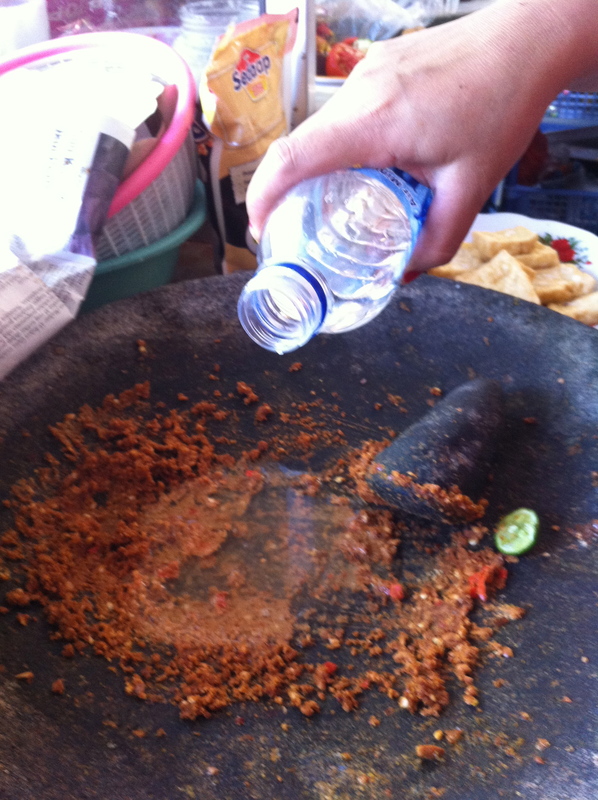 These photos were taken in a warung down the road from where I live in Bali. 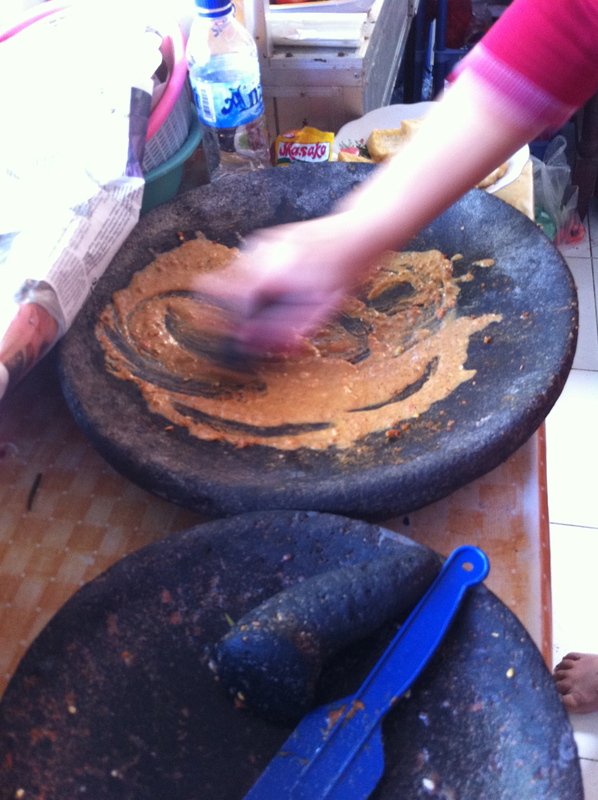 Most days after finishing my mornings work, I trot greedily down there to get my lunch and watch in wonder and awe as the lady who makes it grinds the spices, chops the lontong and vegetables and mixes it all in about 3 minutes flat. It’s poetry in motion watching her and there is always a little audience of children and workmen watching me, this strange yellow haired foreigner waiting for her food. 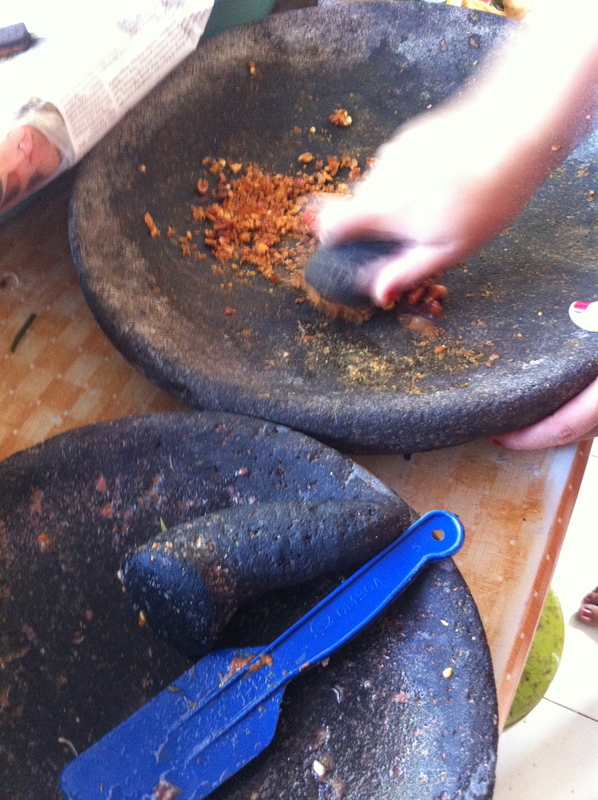 I tried my hand at grinding some spices and chillies the other day and within 30 seconds I’d broken out into a muck sweat and my wrist was aching from the strain! How feeble is that? 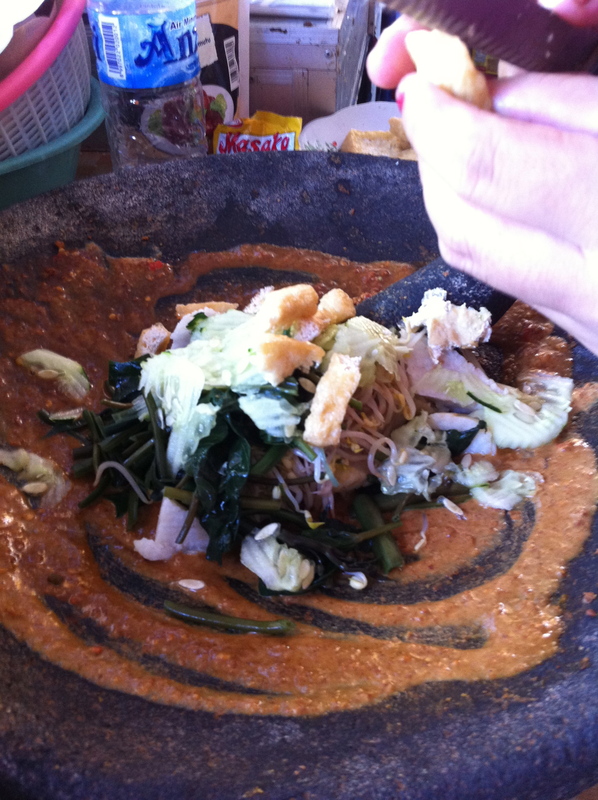 The portion is enormous and could easily feed 2 but I ain’t in a sharing mood when there’s Gado Gado involved. It costs 5,000 rp which is oh, Jeez my maths is terrible but if there are 14,000 to a pound, I’m sure you can work it out?! Right there’s some serious pounding to be done so roll up your sleeves and get cracking or get that magimix into action now! Broken out in a sweat yet? Ah, I forgot the cucumber, a pretty essential part of the meal. And for a truly authentic feel, eat it out of a brown paper wrap! Oh i love it. Sat like Pavlov’s dog. Soooooo jealous. Don’t be jealous B, you can make this at home 🙂 Cheat and use peanut butter if needs be and I think you can probably use any veg to be honest. It’s what takes yer fancy! 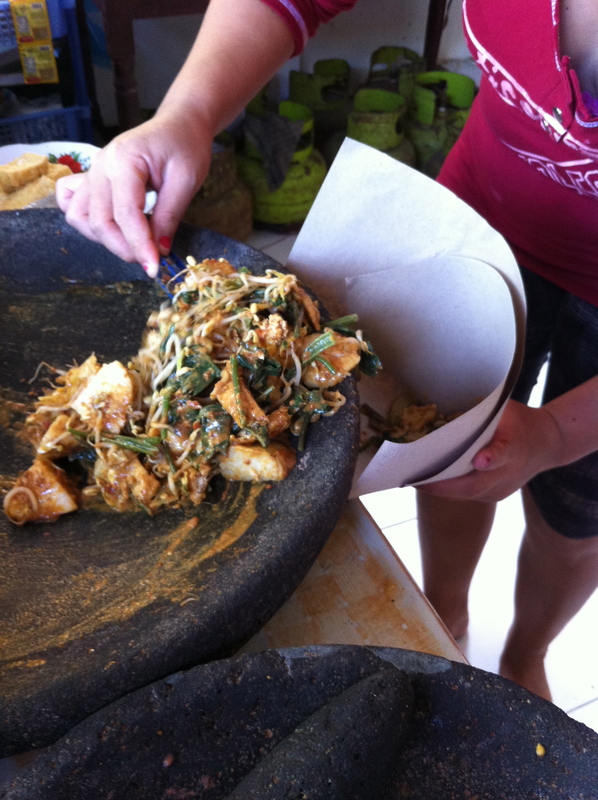 Some gado gado’s have a hard boiled egg chopped up as well. Go for it and report back when you’ve made it! Anyway, if you get yourself over here, you can come and sample it first hand! Glad you mentioned the hard boiled egg. Dutch food only ever became palatable after the introduction of Indonesian food. Of course, some swear by hutspot (mash and peas) or a raw herring. Gerard, thank you for stopping by my blog! yes, the hard boiled egg wasn’t on offer when I ate this at the warung last week in Bali, but I know it’s served with the gado gado here in Jakarta. Although I was brought up in the UK, my Mother was Dutch so I am very familiar with Dutch cooking and I don’t know if it’s just nostalgia, but I rather love it. Pancakes with spek and stroop, you can’t beat it! 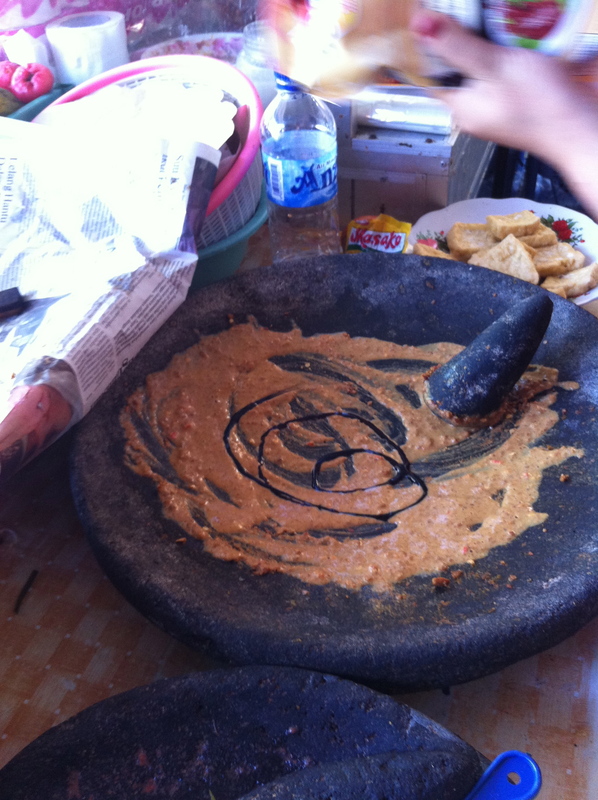 Having said that I used to love Indonesian food as a child and of course Holland was were I had my first taste of it. Funny how I’ve ended up living here all those years later. I tried to find a Facebook page on your blog but couldn’t find one so tweeted your latest post instead. How’s Casa Luna these days and when is the next writer’s festival? When I spoke about Dutch food being a bit bland I should have put in a disclaimer for the pancakes with stroop and bacon. I might even include beefstuk met erwten. Casa Luna that sounds good where is it? and the writer’s festival? Gerard you are going to have to fill me in with all of this, I’m afraid I am very ignorant about such matters. You definitely should have put a disclaimer for the pancakes. The French think their fancy crepes are par excellence, but Dutch Pancakes are miles better in my opinion. Casa Luna is on the main street of Bali’s Ubud and one of the top restaurants. It used to be owned and run by an Australian woman married to a Balinese. The writer’s festival is, I believe, an anual event celebrated in Bali as well. Where in Bali do you live or are you in Java? I like your photography. Those pictures make me so hungry. Damnable diets. There is one Indonesian shop in charing cross. 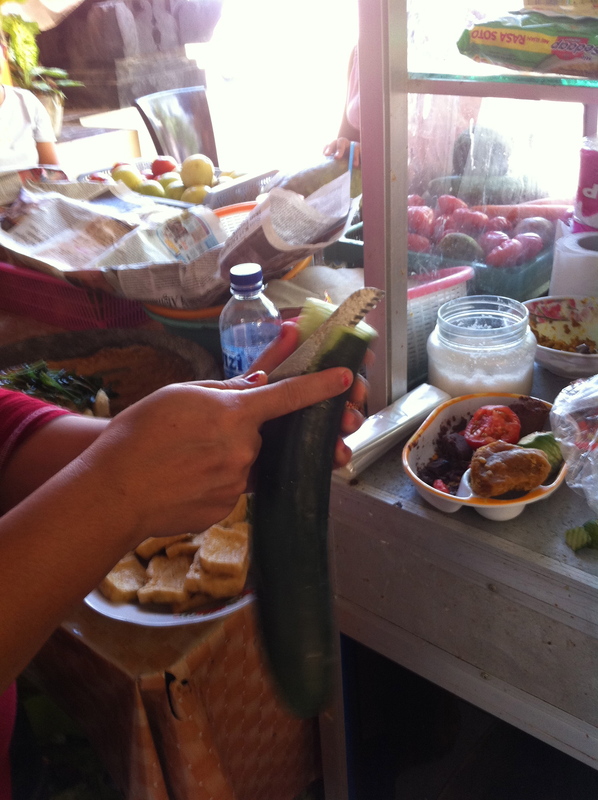 They have lots of Indonesian veggies and ready food too.